Grab your party shirts tap heads! We're starting this party off with a pale ale from Pizza Port Brewing: Party Shirt Pale Ale. 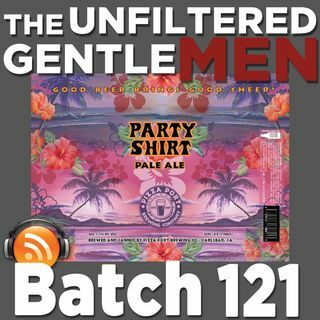 Party Shirt is easy to drink, hoppy, and ready to get the party started! In crotch talk, Scott has questions about going to a wake, Greg takes a trip to New York and does a bit of drinking, and Dan has issues with that annoying guy at the bar. We have a new drunken story from Oktoberfest, this time it's a navy party gone drunk. A listener writes in with a ... Más informaciones booze hack of the week, and this one will save your bubbles. Our Bullpen Beer is Campanology Brewing's For Whom, an Imperial Mexican Stout with Ancho Chiles, Cacao Nibs & Cinnamon. Greg has a gross Tales from Uber, LAX edition. In Booze News: Constellation Brands is losing their CEO, Rogue Ales president is stepping down, ABInBev accused of promoting binge drinking, the booziest cities in America, and more! Our Beer Babe of the Week is Ava make sure and follow her on Instagram @sheknowsbeer! Old Timey Word of the Week: "Limp Handshake ”. Use it in a sentence on social medias for a shout out!